Wobbegong (Orectolobus maculatus) and angel sharks (Squatina australis) have evolved unique electrosensory pores that aid attacks on unsuspecting prey from beneath, according to a recent study. 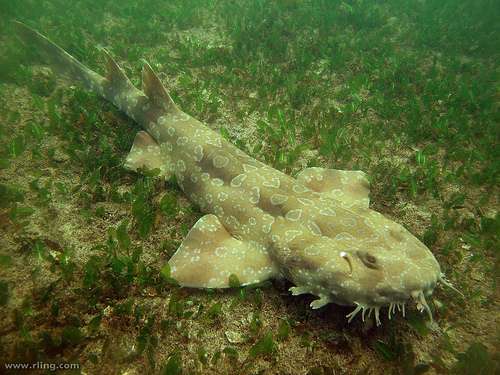 The study, involving UWA Oceans Institute researchers Channing Egeberg and Dr Ryan Kempster, compared and analysed the distribution and abundance of electrosensory pores in both spotted wobbegong and Australian angel sharks to determine their importance. They found both species feature large clusters of pores both dorsally and ventrally, aiding their benthic lifestyle and ambush hunting style. "Both species will sit motionless on the seafloor and wait for unsuspecting prey to pass over their head, at which point they strike with incredible speed," Ms Egeberg says. "We looked at their sensory biology to see if electroreception was being used to facilitate this type of hunting behaviour. "We found that both species have independently evolved a similarly unique distribution of electrosensory pores, unlike any other shark species, that would certainly assist in their ambush feeding strategy." Most sharks possess electroreceptor clusters that are dependant on their method of hunting. "The electrosensory system of sharks has evolved to operate efficiently under the environmental conditions of the particular habitat in which a species lives," Ms Egeberg says. "Some sharks, like the Port Jackson, have as little as 150 electroreceptors, while some hammerheads can have more than 3,000." However both wobbegong and angel sharks lack mandibular clusters which are thought to assist in directing their mouth towards prey. "These differences likely reflect the different behaviors of each species, and so we can learn a lot about their feeding habits just by looking at the distribution and abundance of these electroreceptors," Ms Egeberg says. In addition to dorsal and ventral electrosensory pores, wobbegong and angel sharks posses a rare hyoid cluster that the scientists believe assists in predator detection. "Given the posterior position of these electroreceptors on the head, we believe this cluster may assist in the detection of predators rather than prey, and will be particularly useful to benthic species that spend long periods of time motionless on the seabed," Dr Kempster says. "This is just a theory at the moment, but it could be tested further by blocking certain electroreceptor clusters and assessing a shark's behavioural response to prey or predator-mimicking stimulus."